It's been a busy few days since the Icers wrapped up an undefeated regular season and the end of the Icers era, but I finally have some time to put some thoughts on "paper" about what has transpired and what lies ahead in Strongsville, Ohio. Friday's one-sided 13-1 win over Kent State propelled the Icers to become just the fourth team in the 40-year history of the program to go undefeated at home. The last to accomplish the feat was the 2003-04 squad, one season removed from a fourth-in-a-row National Championship win over Ohio. Unfortunately, the Bobcats turned the tables that spring, beating the Icers in Ames, Iowa. And so the Icers close out their history at the Greenberg Ice Pavilion with a record of 466 wins, 65 losses, 18 ties and 13 overtime/shootout losses. That works out to an unbelievable 85% winning percentage at home. The home ice advantage is due in great measure to you -- the fans of the Icers. Your support over the years has bolstered teams through tough times as much as you have helped to celebrate the good times. Everyone wants the Pegula Ice Arena to be the most intimidating college hockey arena in the nation. The old barn known as "The Berg" has been a hostile environment for the visitors for more than 30 years. I think that it's safe to say that PIA will be even more so! Now on to the National Tournament. The Icers head to Strongsville riding a 13-game win streak in which they have outscored their opponents 82 to 16. They've given up 3 goals twice (a 9-3 win over URI and the come-from-behind 4-3 overtime thriller against Oklahoma) while recording two shutouts (3-0 at Oklahoma and 8-0 over West Virginia at home). Don't forget - they also held Ohio to a goal in each of the two wins at the Bird Arena. Clearly, Penn State has to be the odds-on favorite to capture one last Murdoch Cup. However, everyone knows that they can not take any opponent lightly. Case in point - the 2008 tournament in Rochester, NY. The Icers went in with a record of 31-3-4, and as regular season and conference playoff champions of the ESCHL. However, they did not play well in a 2-0 opening round win over West Virginia. The next night they were smoked 4-1 by Liberty. I do not expect that to happen this year. Ironically, West Virginia could be the opening round matchup. The Mountaineers face Rutgers in the Friday play-in game, with the winner facing Penn State at 5pm on Saturday. If the Icers win the opener the road to Wednesday gets tougher on Sunday, when they'll face either the Sooners or Iowa State. From a personal perspective, I had the pleasure of calling the last championship win at the Bird Arena in 2003. Ten seasons later, I hope to call the final seconds of the last championship victory for the Penn State Icers program. Barb and I hope to see many of you at the Hoover Arena. Shouldn't be a problem, since we will be there all week! We have all had those days or nights when nothing goes right. For Barb and me, it seems that ours always happen on game night. But sometimes, there's a spark that arrives that makes you realize that your problems don't amount to much. Such was the case on Friday night. 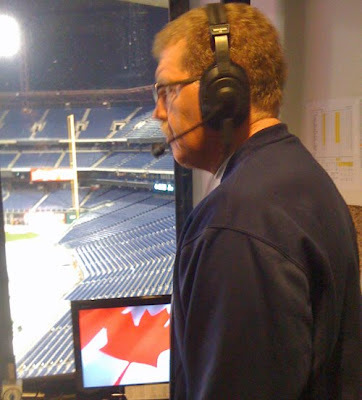 On a night when the Icers cruised to a 8-1 thumping over the Duquesne Dukes, nothing was going right in the booth. A wonky internet connection caused fits with the webcast. Definitely not what we wanted on Senior Night. To add to the misery, both of us were battling head colds. No fun trying to do play by play while trying to keep the sniffles and sneezes in check! Some much needed "pain relief" for us came during the first intermission in the form of a smiling and happy 5-year old named Colton Buckley. Paul Daley, who has been heavily involved in THON activities, contacted me earlier in the day to ask if I could find time to talk to the Icers' Thon child. Gunner did not need to ask. The Buckley family is one of the many THON families, but they are the Icers' THON family. It was such a joy to chat with Colton and his dad Denny about Colton's battle with leukemia. From what we observed in our brief time together, it is a battle that Colton will win. Colton and his sister Madison took part in the shoot-the-puck contest, and after the game they were dishing and receiving passes from Steve Edgeworth for what seemed to be about an hour! One of the unfortunate aspects of having just one camera for our webcasts is that we sometimes miss something taking place off-camera. Such was the case last night. During our chat with the Buckleys, there was a proposal at center ice. Post-game, Colton had his picture taken with the entire Icers team, then got high-fives from everyone. The grin on Colton's face lit up the building. Hopefully, it's a grin that won't disappear for many, many years. The final Alumni Weekend in the storied history of the Penn State Icers turned out to be everything that I expected. Fun, intense, emotional, and above all - humbling. The on-ice results were as expected - a pair of lopsided victories over Mercyhurst that kept the Icers' home unbeaten streak intact. The wins pretty much ensured that Penn State will be the top ranked team in the final poll that will be released on Friday. I said several times what an honor it was and is to be inducted into the Icer Hall of Fame as a member of the Class of 2012. To join so many friends, former players and builders in the Hall is an honor that I will cherish. It was humbling to share the Alumni Dinner podium with Scott Curry, who brought the room to tears as he recounted going from the low of being a teenager told he'd never play hockey again to leading the Icers to a National Championship and representing the USA at the World University Games, with Coach Gadowsky, who once again showed why he is the right man to lead the hockey program into the new varsity era, and with Jay Paterno. Jay's inspirational and emotional speech helped to heal the wounds of the past and challenged the alumni to ensure the future and brought everyone to their feet for a lengthy standing ovation. Before the dinner I received an e-mail from Dr. Lawrence Hendry, the first coach of the Icers. Larry congratulated me and asked if I "had the same lump in your throat that I did" when he was inducted into the Hall of Fame. I tried to keep the emotions in check during the Saturday webcast, but the lump arrived in full force as I stood at the podium that evening. There are so many to thank for their encouragement and support over the past decade, notably Joe Battista, the players and coaches that I have pestered for interviews over the years, former broadcast partners Jason Mals, John Mulhern and Steve "Howie Meeker" Zodtner, fellow Hall of Famer Rodney Martin, the Icers Booster Club and all of the parents who have become lifelong friends. Most of all, I have to thank Barb. I'm not sure that many wives would do what the "Executive Producer" has done going back to our days in cramped and frosty high school football press boxes in Colorado. As Jesse Owens said, friends gather no dust. The true honor for Barb and I is the friendships we have made over the past ten years. They are friendships that transcend hockey. To all of you, we can only say -- thank you! The Penn State Icers had little time to savor the weekend and season sweep of the Ohio Bobcats before getting ready for a visit by the Oklahoma Sooners. The team bus arrived back in Hockey Valley around four on Sunday morning. I'd forgotten how much fun that return trip could be! Less than 36 hours later the coaches on Monday afternoon put the squad through an up-tempo practice with an eye on this weekend's visit by the Sooners. Oklahoma, currently ranked 8th, is 4 and 2 since the Icers hung a 3-0 shutout on them in Norman on January 7. After taking two from twelfth-ranked Illinois (6-3 and 5-0) and sweeping #2 Arizona State by identical 3-1 scores, the Sooners last weekend were swept at home by #10 Minot State by 3-0 and 3-1 margins. I caught up with Coach Gadowsky and George Saad after Monday's practice. George had the tying and insurance goals in Saturday's 4-1 victory at the Bird Arena, giving him 8 goals on the season and 28 in his career. Coach says the team played five good periods of hockey last weekend. They'll need to make it six this weekend against the other OU. The final games in the historic rivalry between the Icers and the Ohio Bobcats could not have been better. Obviously, the two victories by the Icers at the raucous Bird Arena was the capper that the team and its fans wanted. There would be no "Saturday Swoon" by Penn State. The Icers came out on fire and set the tone in the first thirty seconds. Despite going down 1-0 in the third minute, Penn State took a 2-1 lead to the locker room on goals by George Saad and Peter Sweetland. Peter's goal was his first in an Icers' uniform and would stand as the eventual game winner. George added the insurance marker on a second-period breakaway, while Justin Kirchhevel put the final nail in the coffin in the third, finishing another great three-way passing play from Tommy Olczyk and Taylor Holstrom. So the Icers sweep the season series for just the second time in the long history between these two programs. That is a testament to just how intense the rivalry has become over the years. And so it comes to an end, unless the Icers and Bobcats meet in the National Tournament. It's been an honor to have been a part of the rivalry for the past decades, seeing the highs and lows of the battles from a broadcaster's perspective. Thanks so much to all of the players that have made the rivalry what it is, and for making my job so enjoyable (despite the climb into the Bird broadcast booth). Speaking of that, all joking aside, thanks to Dan Morris and Marcus Marazon before him, for providing us with the perfect perch to make the calls since 2002. We will miss it all and wish OU nothing but the best in the future. Okay, maybe starting in the fall! The final season for the Penn State Icers is rapidly drawing towards the finish line, and this weekend marks one of the milestones of this last campaign in the ACHA. The Icers will battle the Ohio Bobcats and their seventh man at the funky bandbox that is the Bird Arena. There is no doubt that the Penn State - OU rivalry is the biggest and baddest in Division 1, despite what others might say. Simply put, these two teams have a good, respective hate for each other that goes back to the days of 5 cent beers and chicken-wire fencing instead of glass above the boards at the Bird. Just ask any of the old Icers about their memories - good and bad - about playing in Athens. For me, it will be one last weekend to climb the scaffold behind the Icers bench to call the action from the best "seat" in the house. As shaky as the perch can be at times, it was a great place to call the Icers' 5-0 whitewash of the Bobcats in the 2003 National Championship game - the last of the four straight for the "Class of Champions". Winning at the Bird is not easy. The Icers since 1990 have a record of 10-13-3-3 on the ice surface that is 15 feet shorter than a regulation-size rink. Bobcats head coach Dan Morris always has a game plan that can frustrate the best teams, including Penn State. The seventh man, especially Gang Green, can be intimidating. The noise is amplified by the low ceiling and tight confines of the arena. Sometimes in the past some in the crowd stepped over the line, but most have toned down their act in recent years. They are still "rabid", but in a good way. One Icers player who is well aware of the history between the Bobcats and Icers is senior Kurt Collins. The State College native grew up watching the Icers and OU, and has been a key member of the Icers in their battles against the Bobcats over the past four years. Kurt and his fellow seniors want nothing more than another sweep in their final meetings with their long-time foe. It is entirely appropros that Monday dawned with a chill rain from low-hanging clouds that have blanketed Happy Valley. 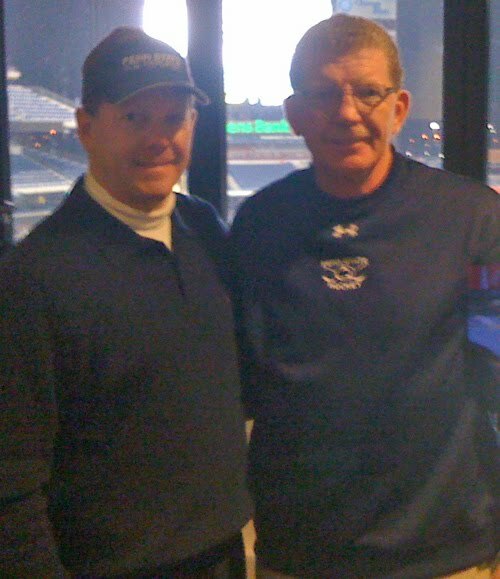 For there is no joy in this community following the passing of Coach Paterno on Sunday. No matter how you feel about him after the events of the past couple of months, there is no denying that JoePa touched thousands of people and, in some way, made their lives better. Even those of us who are not alumni, referring to Barb and myself, understand what the Paternos have meant to this school, this community and beyond. I don't profess to "know Joe", even after sitting through many of his press conferences. I can admit to almost running him down with my car while he was out for his daily walk. That happened a week or two after Barb and I arrived here from Colorado Springs in early 1999. Joe was one of the main reasons that I took the job that brought us to Happy Valley and eventually the Icers. I was a fan of Penn State football going back to the win over Miami at the 1987 Fiesta Bowl, when fellow Canuck Pete Giftopoulos sealed the national championship with his interception. One person that did know JoePa and what he meant to the Icers is Joe Battista. JoeBa and JoePa were two of a kind, beyond their Italian heritage. More than the passion for coaching their respective sports, they shared a passion to make the boys who played under them better men who learned to succeed in life beyond football and hockey. On Friday, we saw the unbridled joy on Joe's face while we spoke during the first intermission, just hours after the Board of Trustees had approved the construction of the Pegula Ice Arena. The joy is dimmed today with the knowledge that a supporter of Penn State hockey will be missing on the opening night in 2013. Missing in person perhaps, but not in spirit. The Icers returned to the Greenberg Ice Pavilion last weekend for the first home series of 2012 and came away with a sweep of the Rhode Island Rams. The two wins couldn't have been more different, with a solid 9-3 romp on Friday in which seven players scored followed by a sloppy 2-1 victory - another of the "Saturday Swoon" games that we have seen too often in the past. In addition to giving Penn State a season sweep in the final year of competition against the Rams, the two wins gives the Icers a 17-3-1 record and a 3-1-1 mark in the first five games of the second semester. Whether or not that's good enough to keep the Icers at #1 when the new ACHA poll is released on Friday remains to be seen. Next up for the Icers - the West Virginia Mountaineers (13-12-0). WVU comes to Hockey Valley after edging Pitt 2-1 in a game played in Charleston, WV on Martin Luther King Day and a 14-1 thumping of Lehigh two days earlier. Paul Daley recorded his 100th career point, assisting on Dan Meiselman's opening goal in Friday's win. Gunner was happy to reach the milestone in front of his family. Be sure to check out this great story by Daily Collegian writer Christine Newby about proud hockey dad "Big Paul" Daley Sr.
A note for those of you wanting to see the Oklahoma game. After finally getting my home phone and internet service repaired and running "up to speed", I have uploaded the second and third periods to our UStream channel. Unfortunately, the first period video was corrupted and I couldn't upload it. With it being a scoreless tie after 20 minutes, I'll just say you didn't miss anything! The Icers toppled the Sooner Schooner on Saturday and in doing so righted their own ship. The 3-0 victory over the other OU ended the two-game skid and gave Penn State a weekend split after Friday's 3-2 shootout loss to Central Oklahoma. Saturday's matinee with the Sooners was a tight affair until Dan Meiselman opened the scoring with his fourth goal of the season at 4:41 of the second period. Meiselman added his second of the game at 3:27 of the third (even though the goal was credited to Chris Cerutti). Paul Daley assisted on both goals, giving the senior 99 career points. Just two minutes later, Taylor Holstrom notched his first power play goal of the season and his 8th overall. The Sooners had no answer for Matt Madrazo, who stopped all 22 OU shots to pick up the win and his second shutout of the season. To all those who had planned on watching on UStream, we had a connection to the wifi at the Blazers Ice Centre, but for some reason I could not get a connection to the internet. To make matters worse, our cell feed to 3WZ-FM in State College was interrupted by a weak cell signal in the arena. I wound up having to disconnect the cell phone from our mixing equipment and hold it like a microphone. During the final two periods I tucked the phone under the earpiece of my headset. To say the least, it was an awkward situation, but at least the call got back home and Barb was able to route it from her laptop to our desktop computer and then to UStream! I can't tell you how nice it will be to be back in the comfortable confines of the Greenberg next weekend when Rhode Island comes to town. The team and staff enjoyed a post-game dinner with Icers Hall of Fame goalie John Davis. John drove up from his home in Dallas to catch the game and catch up with Coach Gadowsky and the squad. John wasn't the only Penn State fan this weekend, with lots of folks decked out in blue and white at both games in the Heartland. I'm not looking forward to an early morning on Sunday with a return flight to Philadelphia via St. Louis and then the bus ride back to Hockey Valley. We should be back just in time to see the Broncos finish off the Steelers. Since we walked out of Citizens Bank Park on Wednesday night, it has been a day of travel and the better part of today trying to find a way to make a video webcast happen for tonight's game against Central Oklahoma. The former went well. The latter - not so much. With no internet access available at the Arctic Edge Arena, I looked into a number of options, none of which would allow us to bring you a good video stream. So - we will record the video while providing an old-style radio webcast on UStream. Barb will be doing her Executive Producer thing at home to get the audio to your computer. Once we are back at the hotel, I will try to upload the recording to UStream so anyone who wants to watch tonight's game can do so at their leisure. Now, on to the Neumann game. With the exception of the outcome, it was everything that we hoped it would be. 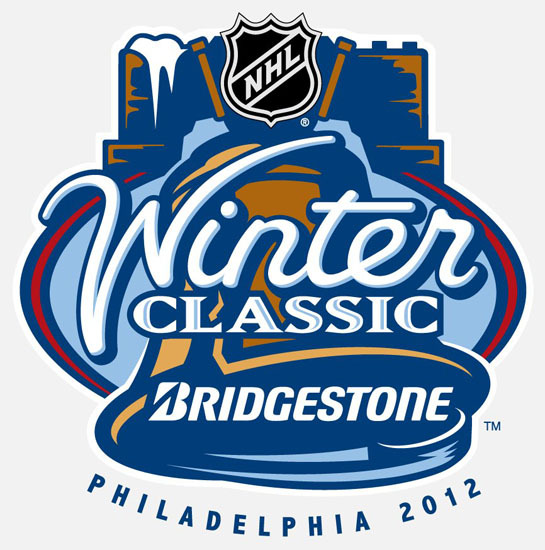 Even though all the trappings of the NHL's Winter Classic had been removed from Citizens Bank Park, just being there and being a part of it was something all of us will cherish. 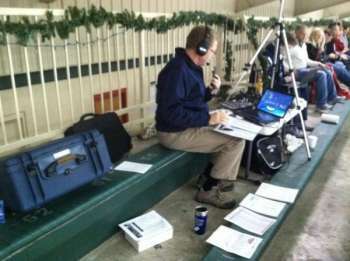 While Barb and I were disappointed that we weren't broadcasting in the elements, it actually worked to our benefit. The setup in the visitor's TV booth afforded us access to some lighting and other perks that we don't usually have. We opened windows to bring some of the outside inside, while not needing to dive into the big bag of cold weather gear. There are so many to thank for all the work they put into the night, especially Ed and his fellow press box attendants, Dave the "fixit" guy who made sure all of our technical issues were resolved, and most of all to Bill Downey and Joe Sheridan for all of the work they did just to make it happen. Lastly, Barb and I want to thank our good friend Steve Zodtner for joining me for one last go-round as "Foster and Howie" (pardon the Hockey Night in Canada reference). Here's the video highlights from the night. There are tons o' pictures and videos of the night floating around the internet. It may be overkill, but here a a few more taken by Howie and the Executive Producer. Arriving at the park as dusk settles in. Our first view from the booth. As Vince Chandler put it, a little snow to put a bow on a great night! The Icers returned to business on New Year's Day, three weeks and a day since wrapping up the first semester with a 4-2 win over Liberty. Assistant Coach Matt Lindsay led the drills as the guy hit the ice at the Greenberg with just three days to prepare before heading outdoors to face Neumann U. at Citizens Bank Park in Philadelphia. The Knights are the number 11 8 (as of Jan. 2 poll) team in NCAA Div. III and will likely be the Icer's toughest test of the season. Neumann heads to CBP fresh off of a championship at the Pathfinder Bank Oswego Hockey Classic. The Knights blanked the host Lakers (currently #2 in D-III) 3-0 in Saturday's title tilt, the first time Oswego has been shut out since January 2002. The Knights, now 9-3-0 heading into the first-ever meeting with Penn State, have become a D-III powerhouse under head coach Dominick Dawes. In just his fourth season as head coach, Dawes is already the winningest coach in Knights' history. The winning began early, with Dawes leading the team to the 2009 NCAA Division III championship, the first in school history. Dawes' current squad is led by forwards Jordan Zalba (Jr., Victoria, B.C.) and Oswego tournament MVP Cory Park (Sr., Mississauga, Ont.). Goaltending wins championships, and Neumann is solid between the pipes. Ross MacKinnon (Sr., Manchester, CT) was the 2009 Frozen Four MVP in his freshman season and was in net in Saturday's win over Oswego. Matt Tendler (Sr., Warminster, PA) is one of three Philly-area Knights players. Tendler was the victor in Neumann's 5-3 win over Hamline in the opener of the Oswego tournament. If I was a betting man, I would lay odds on Coach Dawes giving Tendler the start on Wednesday. Our own Philadelphia guys are going to enjoy playing in their own backyard. Among them is senior defenseman Dan Loucks, who has teamed with fellow Phillyite (Phillyan?) Rich O'Brien to form a formidable shut-down combo. By the way, it looks like I will get my wish for hockey weather. The National Weather Service is forecasting a slight chance of snow and below-freezing temperatures for Wednesday night.